I got this recipe from Real Simple magazine. 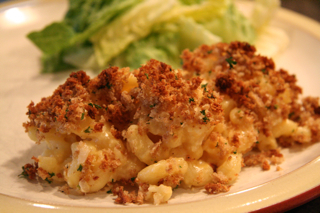 I love baked macaroni and cheese and this seems to be a more healthy version using multigrain pasta and cauliflower. It’s delish! Cook the pasta according to the package directions, adding cauliflower during the last 3 minutes of cooking time; drain. Meanwhile, pulse the bread in a food processor until coarse crumbs form. Add the parsley, 2 tablespoons of the oil, and 1/4 teaspoon each salt and pepper and pulse to combine; set aside. Return the pasta pot to medium heat and add the remaining tablespoon of oil. Add the onion, 3/4 teaspoon salt, and 1/2 teaspoon pepper and cook, stirring occasionally, just until soft, 5 to 7 minutes. Mix in pasta, cauliflower, cheese, sour cream, milk and mustard. Transfer to a shallow 3-quart baking dish, sprinkle with bread crumbs, and bake until golden brown, 12 to 15 minutes.